At this age, the possibilities abound for a very bright future for your teen. Now is a great time for them to explore their various interests. There may be a way for your students to try out these interests in a hands-on manner to help out with their decision making. 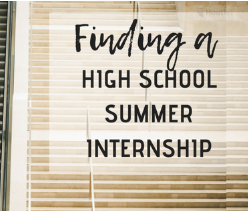 An internship is a great way to let your teen “get their feet wet” in the profession of their choice. If your student struggles with determining what they would like to do in the future they might consider first taking an online interest and skills assessment test. Microsoft High School Internship– This would be great for students interested in technology and programming. Naturalist/Field Research Intern– On the job field-based science research experience.